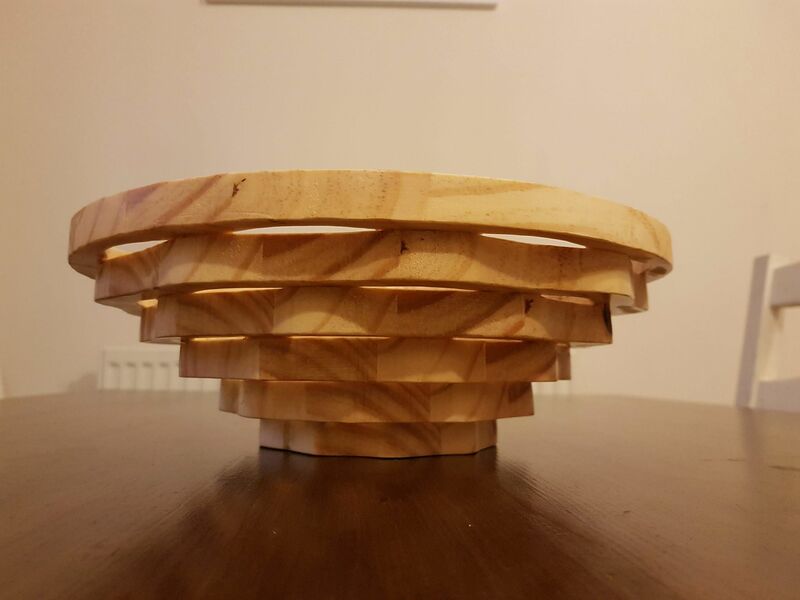 I decided to make a scroll saw basket bowl for my first scroll saw project. I am rather pleased to share with you the results as well as a step by step guide on how I accomplished it, things I intend to do differently in my next project as well as what tools you will require. 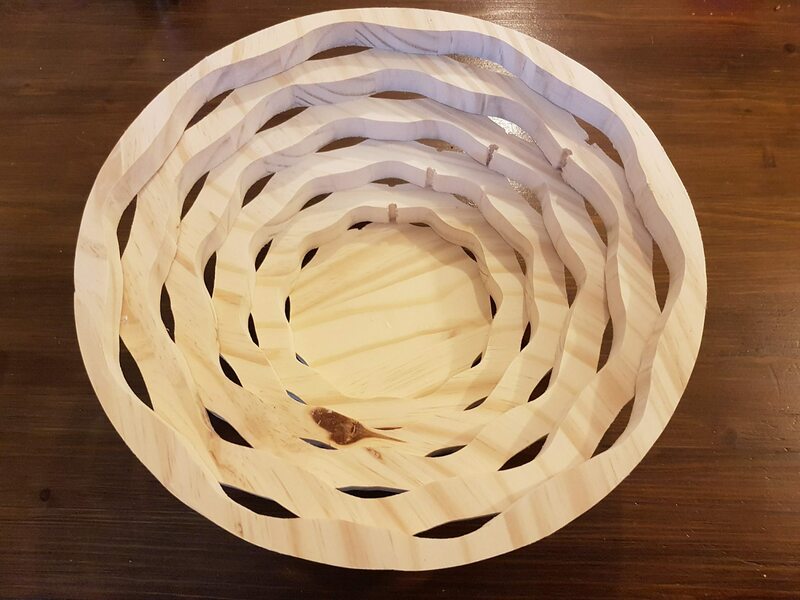 Find a design you like on the internet, I found mine with a quick google search of “Scroll saw basket patterns”. I then scaled this up to the actual size I wanted the basket, printed it and cut it out. The next step is finding a piece of wood you like, there are even some advanced options such as laminating several different coloured pieces together. However as it was my first attempt at this I am sticking to just a single board of cheap pine. 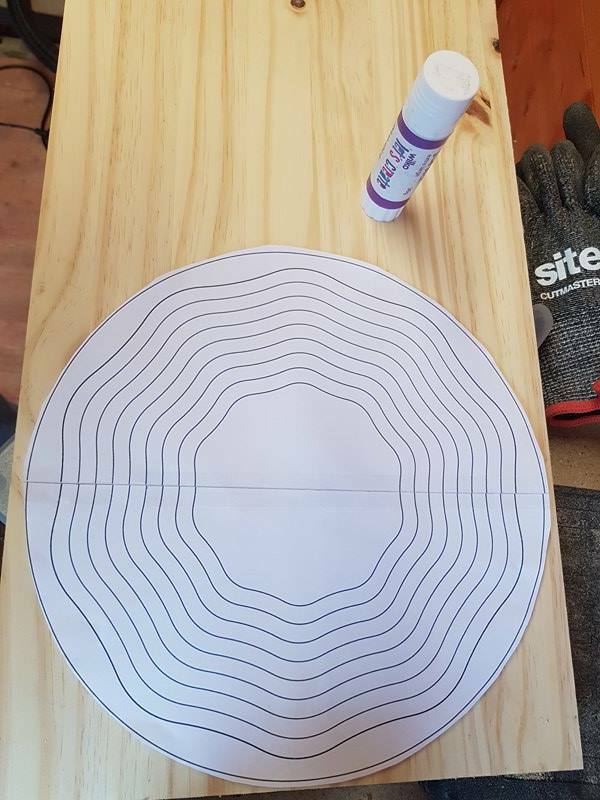 I glued the cut out pattern on to the board using just some ordinary glue stick, however you could use spray on adhesive too. 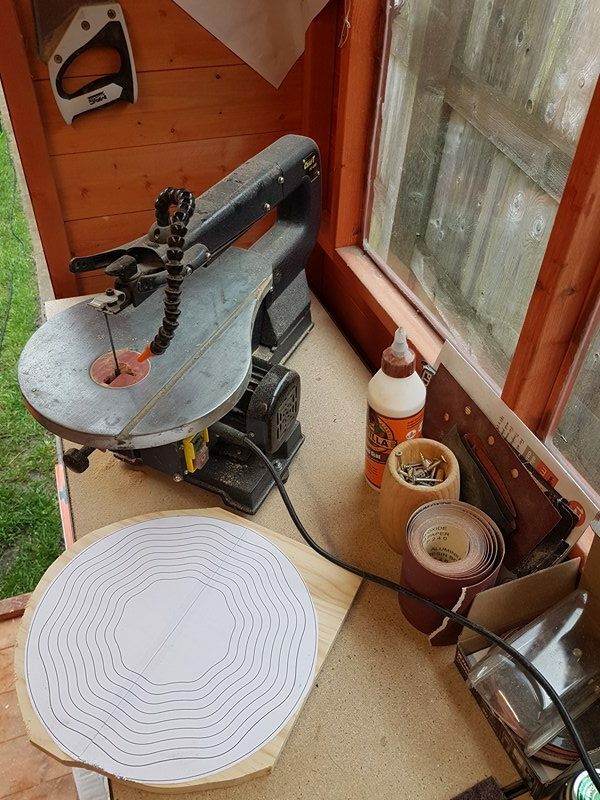 Feed the blade through the start hole and simply cut along the lines, I found this a bit tricky at first but after a few min I found that going slowly and applying slight pressure giving the blade time to do the work was the best way. Making the curves was also a bit harder as I just had a standard blade, however it is still possible, so for now I can make do. 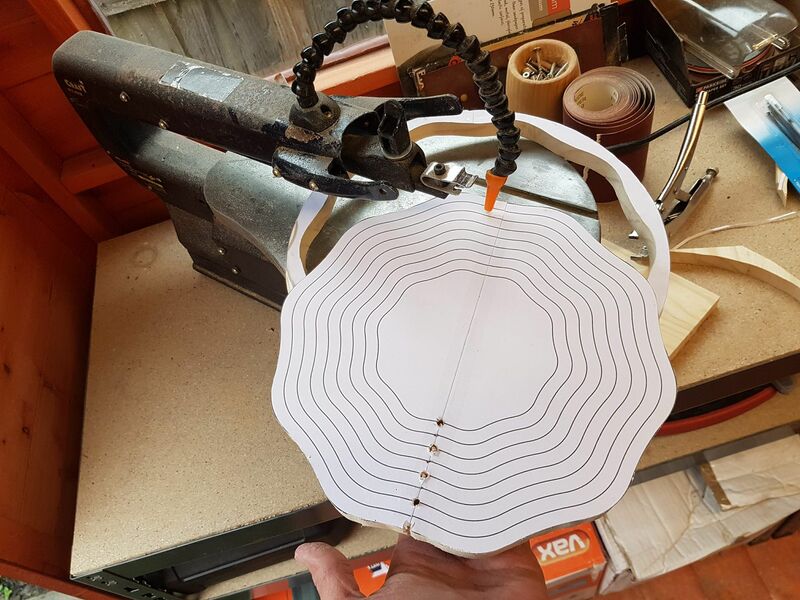 After you have cut out all the pieces you get to decide how you would like to lay them out, you can change grain directions or bowl/basket style. 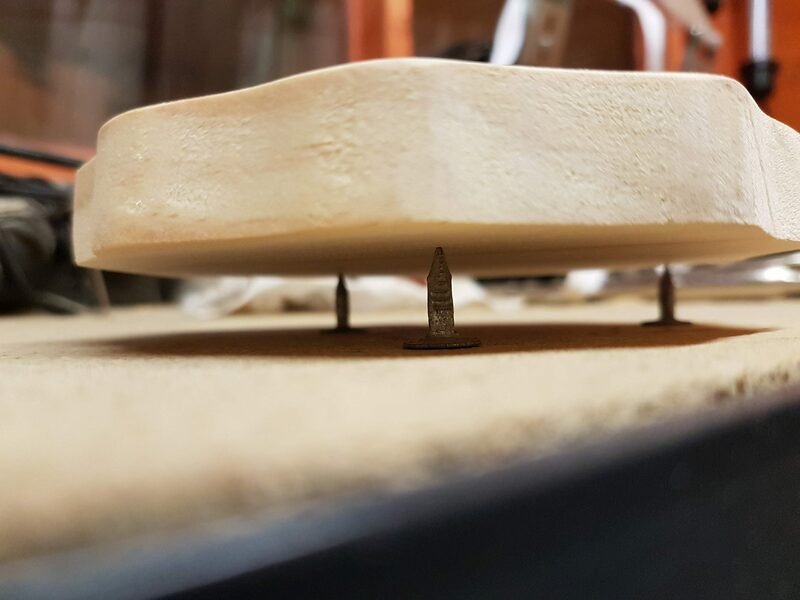 (I found out that I was able to do this as the table was not exactly 90 degrees to the blade.) You can see here I was messing around with the different looks. Now due to the large holes drilled to slot the blade through, I have to fill in the holes try hide them. If you have the pinless blades you may not need to follow this step and can skip ahead. 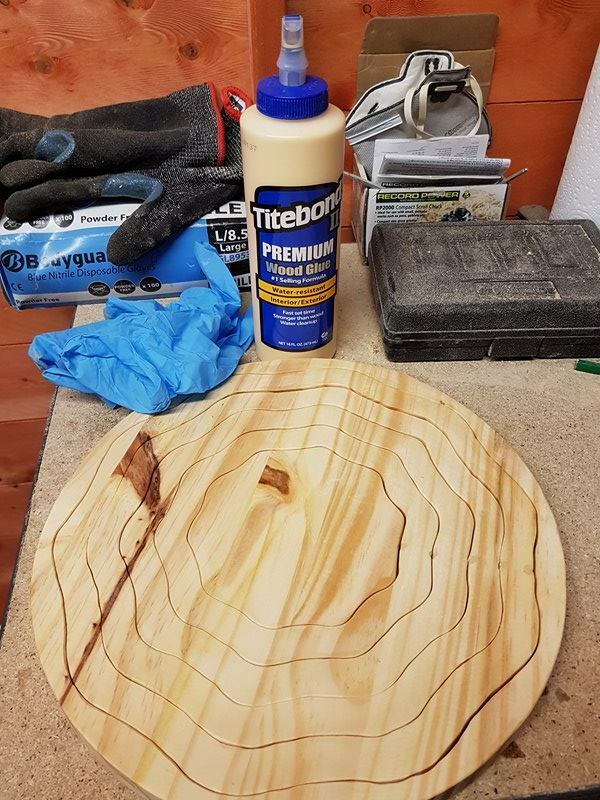 I have a multi-purpose wood filler that I used, letting it dry overnight. 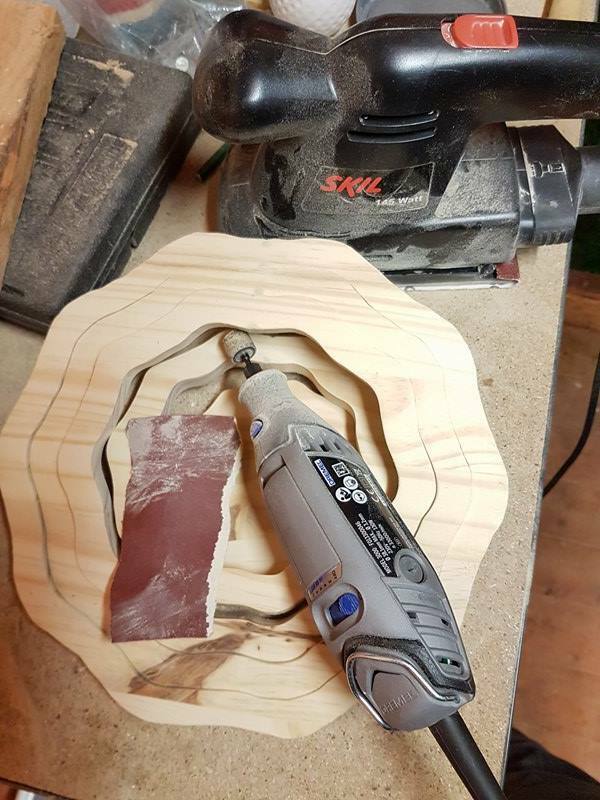 Sanding, this took some time getting the sides smooth but is well worth the effort at this stage as once it is glued up it would become a lot more difficult. I used a Dremel in parts but this can be done by just hand sanding. 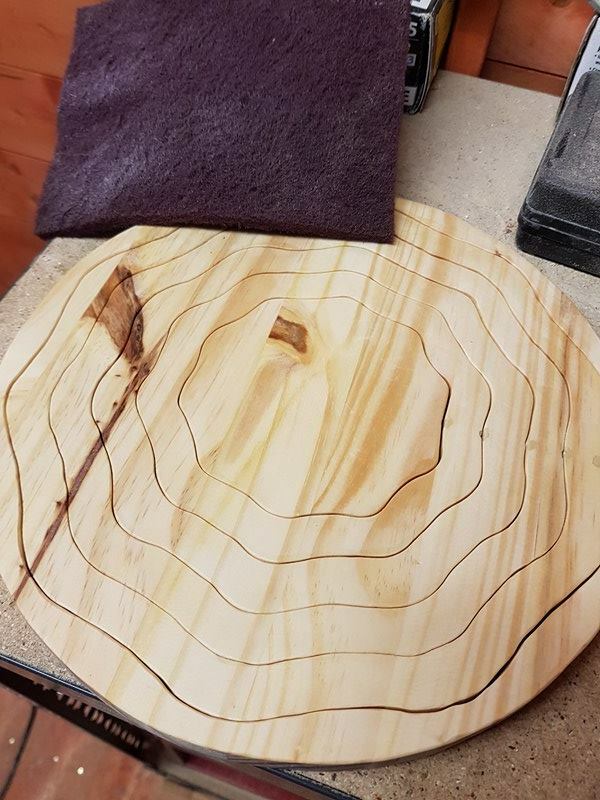 I applied a coat of cellulose sanding sealer and let this dry, as this raises the grain I went over the pieces again and knocked this back with a Scotchbrite pad. Once I had smoothed over everywhere I dusted it all off in preparation for gluing. 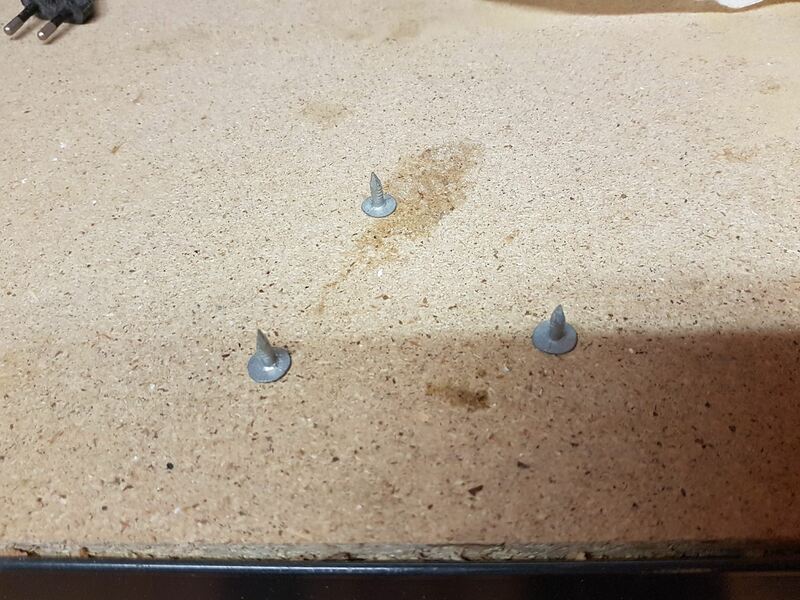 Tip: If you do not have painters pyramids you can just use some thumb tacks to hold up your work pieces to dry. 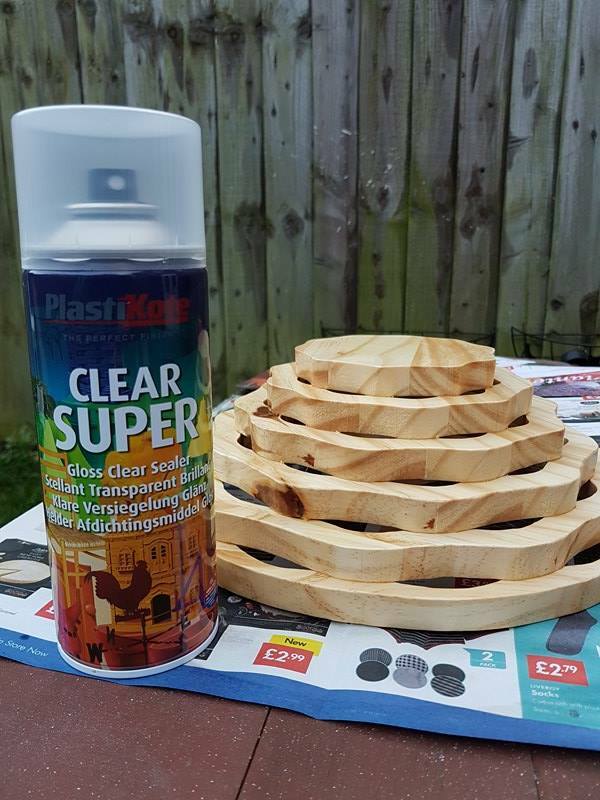 The glue I used on my basket was Tightbond 2 premium wood glue. I applied a small amount of glue on edges that were to be bonded and clamped them together 2 at a time. 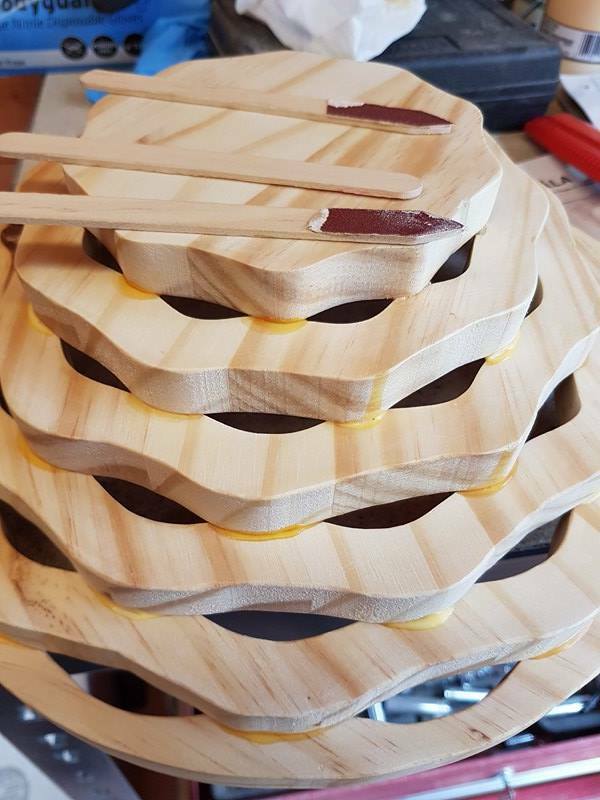 And once these dried I glued and clamped the 3 sets together. I should have wiped away the excess glue before it dried, but it seems I like making work for myself… lol. Cleaning off the excess glue that had dried, although if I didn’t do this, I wouldn’t have been able to give you this handy tip. 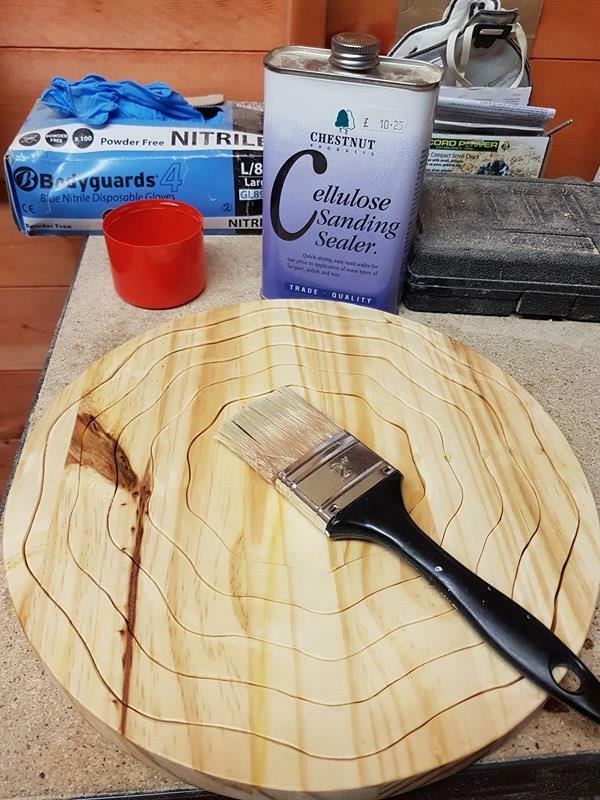 For sanding in small intricate areas it can be made easier with sanding sticks. 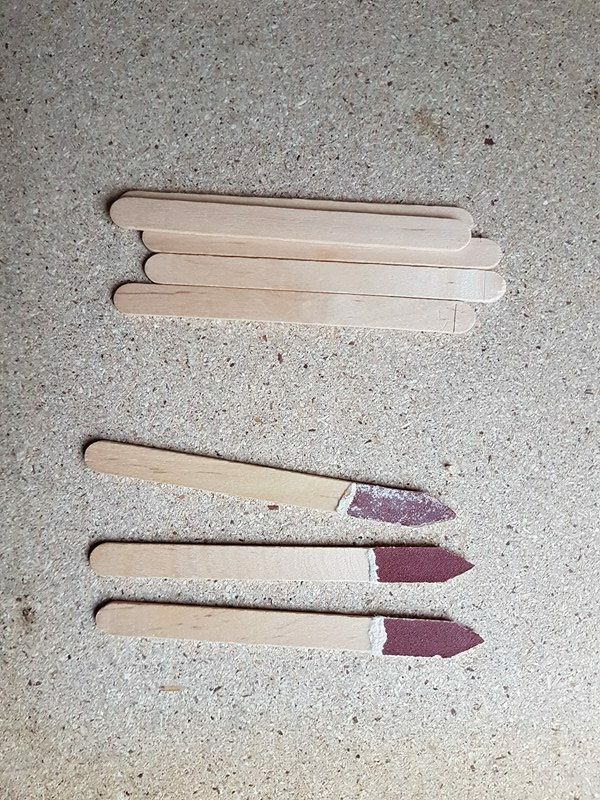 I took some ice cream/lolly sticks shaped them to a point and glued them to the back of some sandpaper. Then using a utility knife I cut them out and got to work cleaning the glue off. 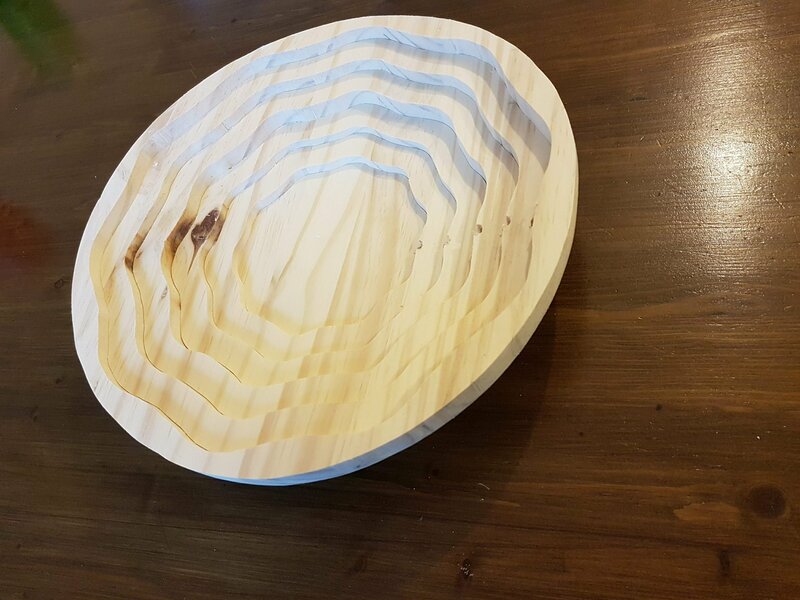 The last step to complete the bowl was to apply the finish, I used a gloss clear sealer from PlastiKote and gave it several light coats rather than a thick coat that will run and take longer to dry. 1st thing I would do differently is use a spiral plain end blade to reduce the size of the start holes. I would either wipe away the excess glue before it dries or use clear drying super glue. 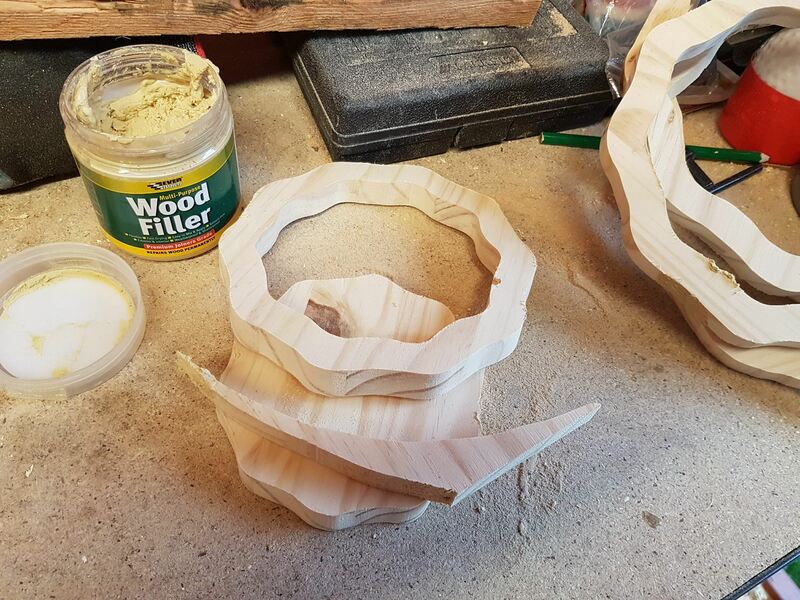 There is only a small area of contact for glueing as the curves were a bit shallow, so I will be using a more exaggerated curve or a more pointy design. I will use a food safe finish so I can use it as a fruit bowl. I hope you have enjoyed this project as much as I have done making it. Please leave a comment below or giving any tips, tricks or things you may have done differently. 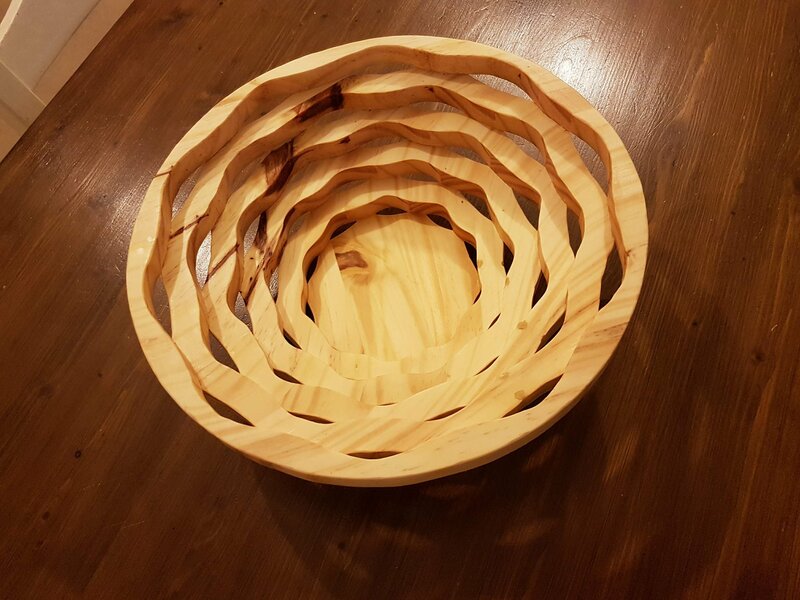 Tag me on Instagram #withtheClarkes or Facebook if you would like to show me your scroll saw baskets.